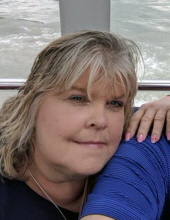 Mary Ellen Kemp, age 57, of Hagerstown, passed away unexpectedly on Friday, October 26, 2018 at Meritus Medical Center, Hagerstown. Born January 12, 1961 in Baltimore, she was the daughter of Patricia Bossert Nelson of Meadowview, VA and the late Frederick Powell. She is survived by her significant other, Tarek El-Shafey. Mary was a graduate of Catoctin High School. She had previously worked for the Department of Defense and moved south to devote all her time and energy in caring for her son. She returned to Maryland and continued her compassionate work for others at The Freedom Center in Frederick, helping veterans and disabled people. She was currently employed with the state of Maryland as a case specialist, helping disabled obtain benefits. Mary had a generous heart, was a loving and devoted mother and grandmother who loved spending time with her grandson, Aaron and making him Mickey Mouse pancakes. She was an avid Redskins fan and enjoyed cooking and traveling, and this past May fulfilled a lifelong dream with Tarek traveling to Paris. Surviving, in addition to her mother and Tarek, are her grandson, Aaron Kemp, her love bug; Aaron’s mother, whom she considered family, Krystal Rhoads and her children, Star and Bryan; siblings, James Gatton and Sherry Eckenrode and husband Jesse; the extended El-Shafey family; and numerous nieces, nephews, aunts, uncles and cousins. She will be remembered by many close friends and co-workers. She was preceded in death by her beloved son, Daniel Kemp; sister, Carol Powell; and brother, Steven Powell. A memorial service will be held on Thursday, November 8, at 11 a.m. at Harriet Chapel, 12625 Catoctin Furnace Rd., Thurmont. Rev. Sally Joyner Giffin will officiate. In lieu of flowers, memorial contributions may be made to benefit her grandson’s future education to www.gofundme.com/hasgde-mary-kemp. To send flowers or a remembrance gift to the family of Mary Ellen Kemp, please visit our Tribute Store. "Email Address" would like to share the life celebration of Mary Ellen Kemp. Click on the "link" to go to share a favorite memory or leave a condolence message for the family.